The most recent presidential election — where Donald Trump beat Hillary Clinton in terms of electoral college votes but lost the popular vote — had many people wondering just how electoral votes were assigned to states. Suppose you read on the internet that the number of electoral votes a state received, was based on its population. 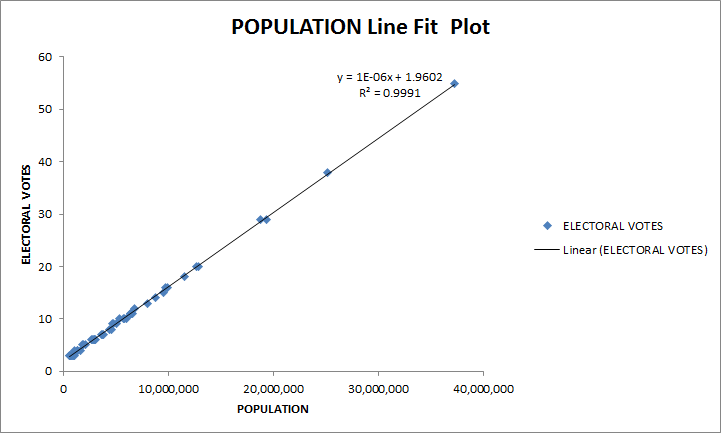 In other words: electoral votes (Y) were determined by population (X). You go on Twitter or Facebook, and post this “fact”. Of course, being social media, someone challenges you to prove it. Here’s how you do it. If you chart population versus electoral votes, you get the following figure, which suggests using a regression as the statistical operation. A regression finds the best line or curve that fits the data. The chart below show the results of the regression. In this case a line best fit the data. This particular regression was done in Microsoft Excel using Data > Data Analysis > Regression, on the table above. A Regression for Population vs Electoral Votes. Because the curve is a line, this is known as a Linear Regression. Statistical operations often include a significance measure. For regressions, this measure is R-squared, which ranges from 0 (not significant) to 1 (significant). In the chart above R-squared is .9991 and since it is close to 1 it is significant. 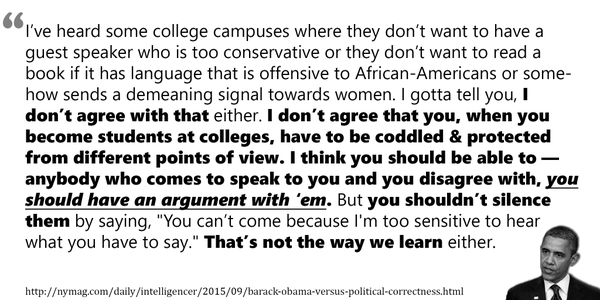 And no one can argue with you, because your theories are backed up with reliable data and appropriate statistics. What’s even better for you is that your theory is predictive. Let me explain. If you remember your high school algebra, m is the slope and b is the y-intercept. 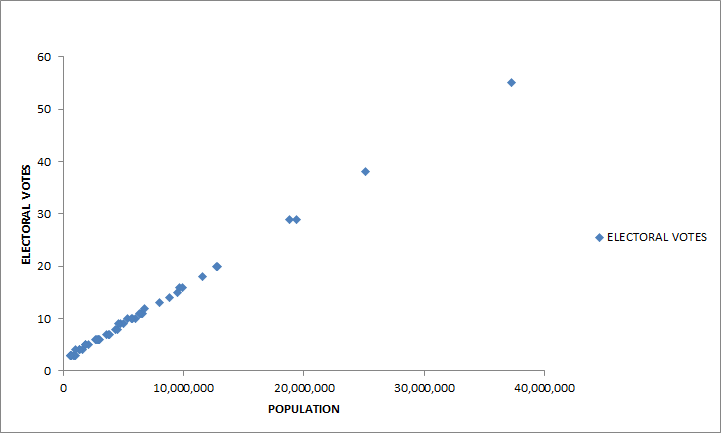 In plain English, take a state’s population, divide by 1 million, multiply by 1.42, add 1.96, and round up. Electoral votes are allocated among the states based on the Census. Every state is allocated a number of votes equal to the number of senators and representatives in its U.S. Congressional delegation — two votes for its senators in the U.S. Senate plus a number of votes equal to the number of its members in the U. S. House of Representatives. The 1.42 times the population in millions denotes the number of representatives a state has. The 1.92 denotes the 2 senators. It’s quite astonishing that a simple statistical operation was able to discover precisely what that statement means! Welcome to Programming 101 (aka MGMT 330 — Fundamentals of Business Programming at the University of New Mexico’s Anderson School of Management). I’m Professor Flor and I’ll be your instructor. Now, it’s a long semester and we have plenty of time to answer questions, so let me answer just a couple of the most common and important questions. Yes, those bullet items are what you list in your resume under skills. A business application is a computer program that’s useful for a business. Such applications usually store and retrieve different “views” of information, usually customer or product information. Contrast business applications with scientific applications that focus on running large volumes of information through equations and graphing the results. We’ll do some graphical representation of the information, but the focus will be on storing and retrieving business-related information to help managers make decisions. How Do I Do Well in the Course? Make sure you can write all the assignments from scratch, from your head, without looking. That last point is very important. Here’s why: If you can do an assignment from scratch, you’ve internalized the important concepts. Many programmers never internalize the skill needed to develop innovative applications. They’re stuck copying other people’s code off the internet and making superficial changes. To be honest, you can create many apps with this kind of superficial knowledge, but the chances of you doing anything truly innovative go way down. And when you can’t find someone else’s code to copy, you’re lost. Don’t be a superficial programmer. aka a Script Kiddie. How Do I Become an Expert Programmer? Programming is a form of mental exercise. Like any exercise, say physical exercise, you get better, stronger, and faster with practice. So practice writing a lot of different kinds of applications. Practice is the only way. There are no shortcuts. Reinvent the wheel — reprogram those basic pieces of code — before you reuse other people’s wheels. As I already mentioned too many people just Copy And Tweak (“CAT” strategy) other people’s code. That will only get you so far. If you want to be an expert, write your own code, at least while you’re learning. No. This is an introductory class and you need to prove you understand the concepts by writing them from scratch. If you are caught plagiarizing code off the internet or from your fellow students, I will FAIL YOU FROM THE COURSE. “Ain’t nobody got no time for that cheating nonsense,” and believe me, I’ve heard all the excuses. Programming is about casting spells on machines so that they serve your will. Okay, okay. So maybe it’s not really magic. But it is magic-like. You have to learn a cryptic language, and you have to speak (type) the symbols in the right order for your spell to work properly. So why does programming have a reputation for being hard? Because there are many pieces involved, which require many different “Mental Models”. What’s a mental model, you ask? A mental model is something in your head that helps you make predictions about how things in the world (people, animals, machines, etc.) will react in response to your actions or events in the world. Suppose you’re a teen and you stay out late—past midnight on a school day. You know your parents will be very upset with you, and possibly yell at you the next day. How do you know that? You have a mental model of your parents! Another example: Don’t stare a dog in the eye because you might make it mad and it will bite you. How do you know that? You have a mental model of dogs. A mental model doesn’t have to be 100% accurate. It’s merely a guide for your expectations and actions. You create mental models constantly and you constantly update your mental models in response to new information. So let’s go through the mental models you need to know for programming. Setting aside colorful magic, wizard, and spell metaphors, how should you think about programming? And technically it’s only storing and calculating, because displaying information is a kind of storing of the information on screen or on paper. But how exactly do you communicate with a computer? Can you simply talk to it? Technically yes, but let’s pretend our computer doesn’t have voice recognition like our smart phones. And let’s continue using “communicating with people” as our starting point for understanding programming computers. When we communicate with other people we simply talk and if they’re paying attention, they hear us and respond appropriately. Typing code from a computer language into an editor. Almost every well-written story consists of three parts: a beginning, a middle, and an end. In the beginning, the hero encounters a problem. The middle is spent searching for a solution. And in the end the hero solves the problem. Output: displaying the information to the user, or storing it, which may involve sending the information across the network. Just like you can’t randomly mix words in a sentence and expect people to understand what you’re saying, you can’t randomly mix programming terms and expect the computer to run your program without crashing. English has a grammar, and Programming Languages have a syntax. When you hear the term “syntax” think grammar. Bad syntax leads to your code crashing, just like bad grammar leads to people misunderstanding you (a kind of human crash). A computer consists of storage (hard drive, usb drive), memory (RAM), a processor (Intel or AMD), and a graphics card (NVidia, AMD). Yes, there’s the network too, but let’s ignore it for now. Your program is kept in storage. When you run your program, it gets moved into memory. The processor reads and executes each line of code in memory. Any code for displaying information gets sent to the graphics card.